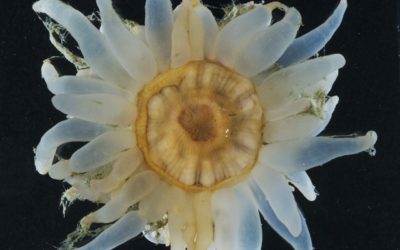 A rapid increase in the frequency of icebergs pounding the shallow seafloor around the West Antarctic Peninsula — as a result of shrinking winter sea ice — has caused the life expectancy of a tiny marine creature (bryozoans) to halve over the last 12 years. This is the first evidence of regional climate warming affecting marine animals living on the Southern Ocean seabed. The results are published this month in the journal Nature Climate Change and are being presented this week at the World Conference on Marine Biodiversity (WCMB) in Aberdeen. Scientists from British Antarctic Survey (BAS) describe how colonies of bryozoans (Fenestrulina rugula) — one of the most abundant animals in the shallows around Rothera Research station — are unable to recover from frequent iceberg scouring. Twelve years ago colonies could live to five years old but now they rarely reach two or three years of age — and most die before they are able to reproduce. Seabed life, such as bryozoans, may be an important carbon sink in the Southern Ocean, and their early deaths could signal wider, severe consequences on the whole ecosystem, with more carbon being released back into the sea. 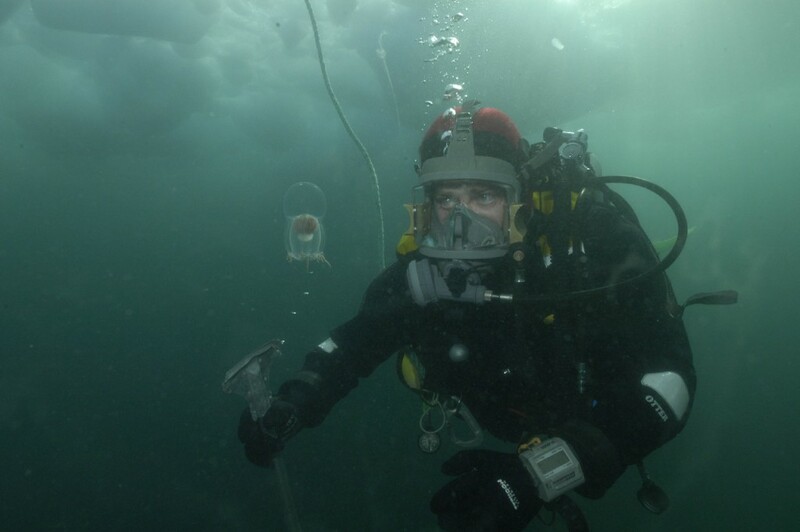 Diver wearing a full face AGA mask. Near Rothera Research Station. 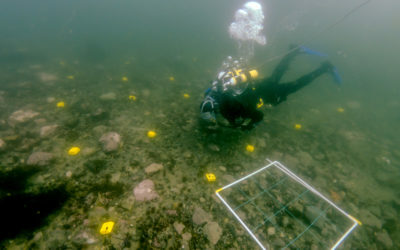 The researchers examined concrete markers showing the rate of iceberg scouring — placed on the seabed by BAS SCUBA divers — as well as bryozoan encrusted rocks situated near them (with tens of thousands of colonies per square metre). In addition, collections of historical records* of winter sea ice (called fast-ice) around Rothera Research Station showed a clear link between fast-ice loss and impacts on experimental markers on the seabed. It’s likely that iceberg scouring has similarly increased in other areas of winter sea ice loss which means that increasing mortality of seabed creatures could become widespread. The paper Reduced survival of Antarctic benthos linked to climate induced iceberg scouring by David KA Barnes and Terri Souster is published in Nature Climate Change. Dr Dave Barnes, British Antarctic Survey, Tel: +44 (0)1223 221613, email: [email protected] speaking at World Conference on Marine Biodiversity, Aberdeen 28–30th Sept, tel: 07599 322090. *The researchers collated data from Rothera Marine Assistant reports, annual travel reports, meteorological reports and wintering staff diaries, to count the number of days per year during which the sea surface in Ryder Bay — adjacent to Rothera Research Station — was frozen into ‘fast-ice’. (aquatic animals sometimes referred to as moss animals) feed on micro-organisms suspended in the water column. Their larvae are benthic and short-lived but this is the dispersal stage — as adults they anchor themselves to the seabed. Many of the 500 species around Antarctica are restricted to shallows and particular continental shelves. These tiny animals provide a location for biodiversity on the seabed by offering shelter for other animals and acting as prey for limpets, small fish and sea urchins. Bryozoans feed on phytoplankton (small marine plants) that need carbon dioxide in order to grow and reproduce. The carbon in the phytoplankton is then taken by up by the bryozoans and is used to form its skeleton and tissues. is based on Adelaide Island on the West Antarctic Peninsula. It is the main hub for marine biology research and deep field operations. is a large piece of freshwater ice that has broken off from a snow-formed glacier or ice shelf and is floating in open water. 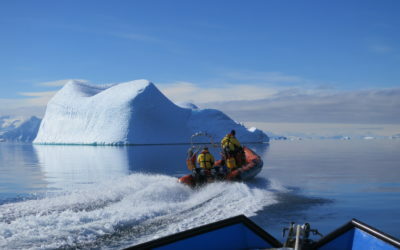 Many factors influence the probability of an iceberg impacting on an area of seabed. These include depth, seabed topography, proximity to an iceberg source, wind direction and tidal regimes. 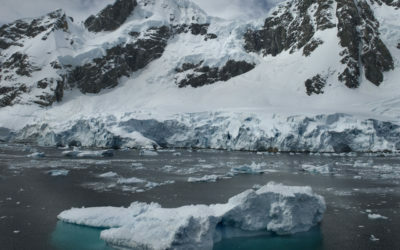 The Antarctic Peninsula is an area of rapid climate change and has warmed faster than anywhere else in the Southern Hemisphere over the past half century. Climate records from the west coast of the Antarctic Peninsula show that air temperatures in this region have risen by nearly 3°C during the last 50 years — several times the global average and only matched in Alaska.